My grand daughter is a great foody and she is also very much interested in cooking. I am amused and amazed at her ability to identify the ingredients in a dish at such a tender age. She can rattle off the names of the ingredients used in a particular dish by just biting into a tiny portion of the dish. She once described a sweet that she had savoured at a dinner party, the name of which she could not recollect immediately. "The flavours of coconut and jaggery just exploded in my mouth Amma, and it looked and even 'behaved' like jelly!" Being an ardent fan of 'Master Chef' this is how she described the sweet dish! I kept guessing the name of the sweet in vain, for a long time until I got the name of the sweet from my daughter. 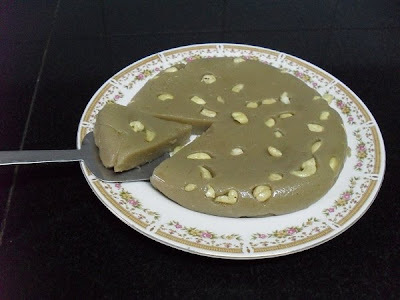 The sweet which was meticulously described by my grand daughter was DODOL! Dodol is commonly prepared in Goa. Here is how I prepared Dodol for my grand daughter. 1. Break coconut and leave it in the refrigerator for 15 minutes. 2. Insert a sharp knife between the coconut kernel and the shell and ease out the edible portion. 3. Cut the coconut into small pieces. 4. Add a cup of water and grind the coconut pieces to a smooth paste in a mixer. 5. Add a cup of warm water to the paste and press the paste through a strainer. 6. Collect the required quantity of milk by repeating the process two more time, and discard the squeezed out coconut. 1. Mix rice flour and coconut milk smoothly without forming lumps. 2. Dissolve jaggery in a cup of water and filter it. 3. Blend both the liquids together. 4. Grease a dish and sprinkle the chopped cashew nuts over it, and keep it aside. 5. Cook the mixture in a heavy bottomed pan on medium flame. 6. Keep stirring to avoid forming lumps or burning. 7. It takes some time for the liquid to thicken, but stirring should never stop. 8. 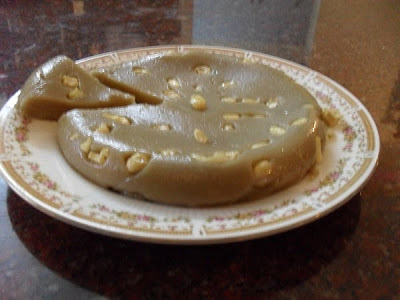 When the liquid thickens and forms into a mass leaving the sides of the pan add ghee to give an extra gloss to Dodol. 9. Pour the cooked mass on to the greased dish, pat it evenly using a greased spatula and allow to cool. 10. When the sweet is set invert it on to a plate and cut into wedges. Experience the ecstasy as 'the flavours of coconut and jaggery explode in your mouth' while you savour a piece of Dodol! Bravo to your grand daughter . And to this delicious DODOL ! a simple yet yummy dish. I am wowing at your grand daughters ability to identify ingredients. What a lovely, tempting description. Dodol is a traditional Malay desert..its well known in my country(MALAYSIA)..its my favorite too..usually they come in 2 flavors.coconut & durian.. i love durian..it smells great..